We are fortunate to have met or spoken with many lovely people due to my husband Rahdo’s hobby of filming run-throughs of board games. He’s been doing it for a few years now, and at least a couple times a week, someone says or does something really nice, and it warms the cockles of my heart. It’s just so affirming to know there are loads and lots and oodles of wonderful, kind, considerate people out there! 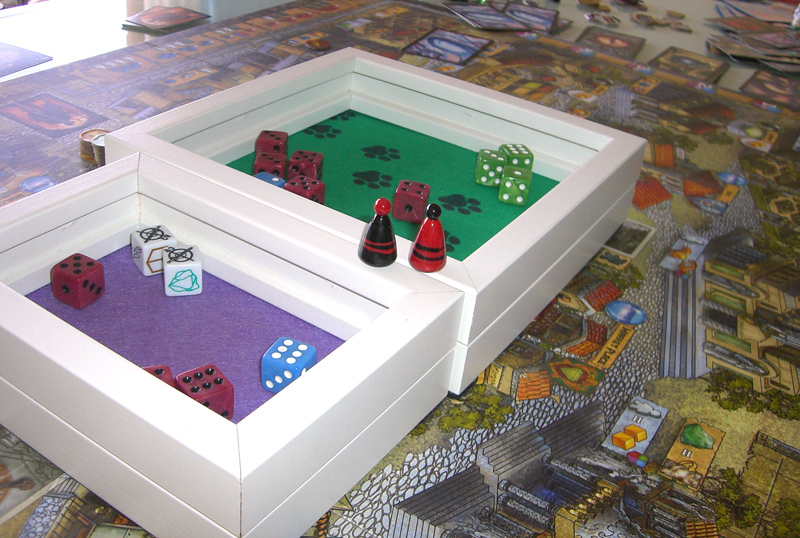 For instance, we have been the lucky recipients of these very handy dice-rolling boxes. Not once, but twice! Last year a very nice man named Shaun Williams made us (well, me really, as it turns out) the purple one [cause I love purple, and, to be quite honest, I’m a bit of a wild roller, so it’s been brilliant in keeping our (yeah, ok, MY) dice on the table]. But of course, Rahdo’s been using it too, in his filmings. But it’s purple, and so…as the color conventions in the Ham household go…mine <grin>. These are made by Shaun Williams at www.customdicebox.com. A thoroughly nice guy. I wanted to do something nice back for Shaun, maker to maker, so I’ve just sent him the red and black player markers shown in the picture above, plus a first player marker. I hope he enjoys them, and I’m happy to put nice energy back out there in the world.